Major General Harold Mashburn, Jr's. last command was as the Commanding General, Marine Corps Logistics Command, Albany, Georgia. General Mashburn received a B.S. degree from the United States Naval Academy and a M.S. degree in Engineering Management from the Air Force Institute of Technology. General Mashburn's operating force assignments include duties as Construction Officer, Engineer Platoon Leader, Executive Officer and Commanding Officer of an Engineer Company, 1st Engineer Battalion; Aide-de-Camp to the Commanding General, 1st Marine Division; Utilities Officer, Executive Officer and Commanding Officer, Engineer Support Company, 3d Engineer Battalion; Engineer Operations Officer, Fleet Marine Force, Pacific; Operations Officer and Executive Officer, 3d Combat Engineer Battalion; G-3 Plans Officer and Commanding Officer, 8th Engineer Support Battalion, 2d Force Service Support Group; Commanding Officer, Combat Service Support Group 1; and Commanding General, 2d Force Service Support Group. He has also served as Officer-in-Charge, Officer Selection Team, Oklahoma City, OK; Operations Officer, Depot Maintenance Activity, Barstow, CA; Chief, Logistics Readiness Center, J-4, The Joint Staff; Director of Logistics, J-4, U.S. Forces, Japan; Assistant Deputy Commandant for Installations and Logistics (Logistics Plans and Policy); Assistant Deputy Commandant for Installations and Logistics (Facilities and Services); and Commandant, Industrial College of the Armed Forces. General Mashburn is a graduate of The Basic School, Basic Engineer Officer Course, Engineer Officer Advanced Course, Amphibious Warfare School (non-resident), Marine Corps Command and Staff College (non-resident), and the Industrial College of the Armed Forces. His personal decorations include the Defense Superior Service Medal with two Oak Leaf Clusters, the Meritorious Service Medal with Gold Star, and the Navy and Marine Corps Commendation Medal. Deputy Chief of Staff for Installations and Logistics (Facilities), Headquarters US Marine Corps. 4, US Forces Japan. In addition to ICAF, General Mashburn is a graduate of The Basic School, Basic Engineer Officer Course, Engineer Officer Advanced Course, Amphibious Warfare School, and the Marine Corps Command and Staff College. Albany, Georgia - Former Commander Harold Mashburn, Junior is remembered. He died just two days after retiring from MCLB, Albany. At a service Thursday, General Mashburn was remembered as a leader who did not show weakness, even in the face of illness, but was extremely tolerant of weakness in other people. Many of those who served under him, as well as friends paid their respects in a memorial service. “The general, while he was a very private person, loved his Marines and sailors under his command and he loved his corps deeply,” Said Navy Chaplain Richards. “He did not want people to see his illness, because he did not want people to see in him a weakness." Another memorial service was held today at the Naval Academy Chapel in Annapolis, Maryland. 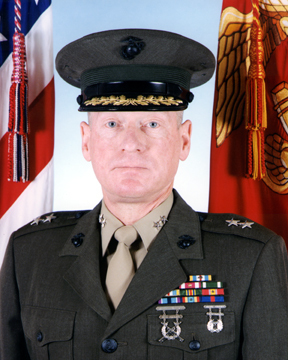 Major General Mashburn will be buried at Arlington National Cemetery on December 7, 2004.